The inaugural Bedford half marathon was billed as a friendly, flat, multi-terrain race starting and finishing in Priory Country Park, Bedford and in truth for a first time event was pretty good. GYRR was represented by new member Paul Reeve. The pre-race literature was very professional as was the website and the regular e-mailed eye-catching updates helped build up the anticipation for the runners. The race unusually set on a Saturday was an event for the whole family with the main event starting in waves at 9.00am and the mini race in the afternoon. For the uninitiated, Priory Country Park is an established green area, of around 360 acres, made up of lakes, meadows and woodland, partially enclosed within a bend in the river Great Ouse and access to it was uncomplicated and easy. It is a very nice venue and the runners and spectators were complimented by the dog walkers, strollers and tourists you would expect to see at such a place. On arriving some 2000 or so of us were encouraged gently by a few smiling faces to the start area which was adjacent to the cafe/visitor centre by one of the lakes. The atmosphere was lively and somewhat akin to the feel you get at 'Run Norwich', with plenty of options for the spectators and runners for food, drink, seating (on straw bales) plus a stage where the band for the day was setting up. Although I didn’t hang around after there was a real sense that people were there for the day. Due to the vast expanses of open area the race centre with quaint tall white handmade signposts was easily navigable and elements such as the toilets official (porta-loos) toilets unofficial (bushes), baggage drop and race HQ were busy but not overcrowded. To be honest because it was very warm and sunny and everyone was in a good mood the lack of enough welcoming smiling volunteers (Like those you get at a GYRR event) was noted but didn’t cause too much of a problem. Close to the HQ were the holding pens for the various waves and this element was a bit unorganised with too many spectators here and around the funnel to the start. Wearing my GYRR vest, I eyed the odd Jaguar (boo!) and Gazelle (hiss!) but not too many from Narfalk and was pleased to be ushered in wave 1 (Sub 1:45) to the start about 200 yards from the pens. The chip timing system and start mats were positioned at a narrow pathway opening that led onto the first part of the run that was on a compacted trail with plenty of space for those who wanted to push through to the front and plenty of space for the likes of me to settle into a pace without being barged about. The racing snakes at the front disappeared into the distance after the usual damp squib air-horn start and the next few hundred of us stretched out to embark on the course. The waved start also continued every five minutes until all 2000 or so runners were away. The course was pretty flat except where we had to cross the Bedford bypass over a footbridge which is where all the elevation gain and loss was made when you check your Strava or Garmin later. This bridge was at around 2 miles and till then despite running on the park for a short distance the surface changed to a path similar to that you find at Eaton Park or Hyde Park. Immediately after the crossing, the race then threw up one of its slight problems. We entered ‘Danish Camp’ and joined a ‘narrowish’ track similar to Marriots Way which was a bit uneven. But the real issue was because the organisers decided to add a (albeit really pretty) loop of about 4.5k that you had to complete twice before you crossed back over the A421 at the 8 mile mark. For the very fastest the loop did not provide any congestion problems as they almost certainly got past most of the masses on their second loop. For those around me it was chaotic. A throng of runners in later waves were entering Danish Camp as those on their second lap of the loop joined this group. To add more confusion for the first 5k of the whole race we were greeted with numerous unnecessary ‘Keep right’ signs, as we entered the loop, the signs were now saying ‘Keep left’. On the narrow tracks there were plenty of confused people and those coming through were constantly weaving just like you do at the start of the VLM or GNR. For me I didn’t mind – it meant I was less likely to be stung in the face (again) by a straight flying wasp. 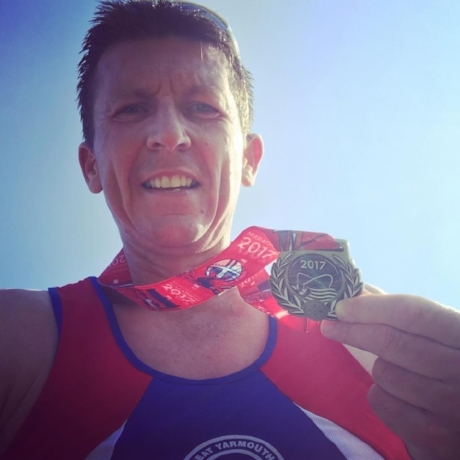 Although I resisted putting my arms out by my side like an aeroplane and making a noise as I weaved past people – but in my head I did that which kept me smiling through that part of the course. Throughout this the only stressful thing was joining someone around halfway who was at my pace who had some coins in their pocket – oh man! How annoying is that? I checked my watch as I went through halfway and was pleased that it 51 min on the money so I felt I had a SB in me (1:44). Running by canals through the trees weaving like a plane was certainly good for my mood and as I joined the hard-core path again at 8 mile all was well. The next part of the race was very flat and wide and headed into Bedford towards the Ouse and along the Embankment. I left jingly jangly coin man behind at this point and was spurred on by the growing crowd and smiling volunteers (No Jelly Babies though!). This ‘fastish’ section was on good paths and navigated past the start, into the beginning of another loop (10M) where I saw some racing snakes and a Jaguar (Boo!) go through in the opposite direction. Shortly after this I encountered a heart thumping moment when a pain suddenly shot through my calf. I recall saying out loud ‘oh no, not now!’, so I stopped and quickly assessed. A stretch or two, a deep breath and nearly a minute went by when I decided it was cramp and the fourth pint of King Fisher in the Indiya Curry House (Highly recommended BTW) the night before that made me stop. Anyway I dug in and pushed on. I actually picked up pace and then ran my best 5k of the day despite this and a few more issues along the way. The place where I saw the leading runners was narrow and the path was delineated by training cones not fencing or tape. Therefore it was single file and I could foresee congestion very soon for some people. In good form and arriving at the 12 mile point in the park we were then ushered past the Race HQ on a lap around the lake, the terrain changed back again to track and then for the last 1km my nemesis – ‘Grass’. I hate it! A little tired, a chap in front of me got on my nerves as he just wouldn’t let me past, so I did a ‘long cut’ around him and got away for what I thought was the last 800m. To my delight I came to an open field with a 400m to go sign and decided I had a little sprint finish in me and was funnelled for the last 100 yards down a noisy last straight and crossed the line in excellent spirits in a rather pleasing 1:41:39 (Just 13 secs off a PB).